As believers, we know that God is big, loving, and good. But sometimes when our circumstances are difficult, and things aren’t working out how we hoped, it’s hard to believe God is kind. How do we embrace that truth about God in our uncertainty? Today’s guest on the iDisciple Podcast, Annie F. Downs knows exactly how it feels to wrestle with that frustration. Annie is a bestselling author, nationally known speaker, and host of the popular “That Sounds Fun” podcast. Despite all of her success, in recent years Annie has found herself struggling to believe God was kind when things weren’t turning out the way she hoped. In this episode, Annie introduces us to her personal walk of faith and the story behind her newest book, Remember God. 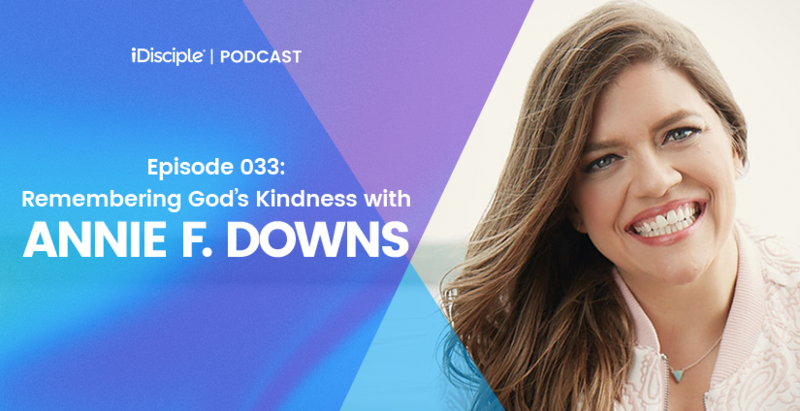 With infectious joy and candor, Annie takes us on a personal journey through some of the highs and lows of her life in the past few years and explains how she found God’s kindness and love in the midst of difficult times. We are thrilled to introduce our listeners to Annie and pray that her humor and wisdom will shine a light on anyone struggling to truly feel the truth of who God is! Annie shares the story of how she felt God directly calling her to pack up and move to Nashville, and why she is “less comfortable and more confident than she has ever been” because of it. How her time as a teacher showed her what it means to impact people’s lives without being able to directly talk about God. Annie’s unusual path to being an author, and how self-publishing her first book after being rejected by publishers eventually lead to the career she has now. Why “Remember God” is the book she never wanted to have to write, because she had to ask herself hard questions about whether or not God was actually kind to her, and why the black cover is a visual representation for what she was dealing with when writing the book. The juxtaposition between the career success she was getting and the personal frustration she was living in, and how her desire for a relationship and happiness felt so fleeting. Annie gives rapid-fire explanations behind some of the most meaningful things in her life, including fasting, her bible, and her group of girls. A little bit of backstory behind the prayer that changed her life, and why she is praying that over everyone who reads her book.